Stunning collection of most beautiful, reliable and best beauty salon, spa, massage parlour WordPress themes helps you build professional looking website to gain more popularity in no time. If you wanna run a successful beauty salon, spa services or massage parlours business then popularity is the key to success. To gain popularity in beauty salon kind of businesses is always stiff task, But if you have website to showcase your products and services, its fairly simpler than you think. 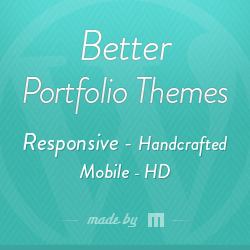 Have a look on these themes and find the best for your business. Spasalon is beautifully designed, clean & stylish premium WordPress theme fits well for Spa salon, beauty salon, skin treatment, detrox treatment, facial treatment related websites and featured with full width image slider powered by FlexSlider v2.0 jQuery plugin and manage theme easily through theme options panel so easily. Spasalon is also capable to your setup online shopping to showcase your products with product template and also included with beautiful product details page design. Spasalon is pure responsive, translation ready WordPress theme readily available with 5 beautiful colour schemes, custom widgets, useful shortcodes, handy page templates and much more. 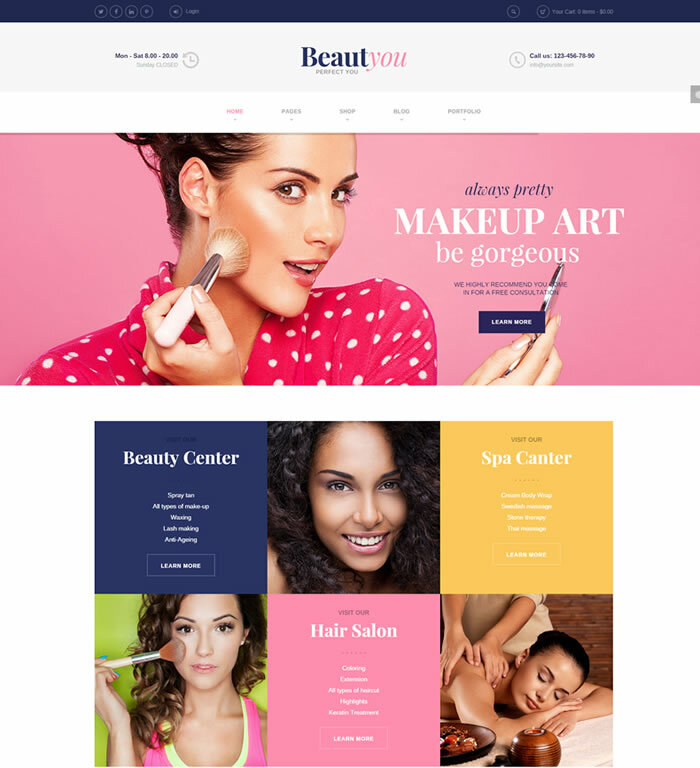 BeautyYou is 100% responsive, mobile friendly and well coded WordPress theme suitable for Beauty center, Hair care, Spa salon, Makeup, Beauty shop, Beauty blog and portfolio sites. Theme has advanced theme options panel provides powerful tools for site customization, layout management, flexible header layouts, slider management and still a lot. BeautyYou theme comes with embedded sliders powered through Slider revolution ($18), Flex and swiper slider plugins helps you to build pure responsive, touch friendly sliders with ease. Also bundled with Visual composer ($33) drag n drop page builder plugin at no extra cost and helps you to build professional looking pages on fly. Built with mega menu configurator allows you to create stylish navigation menu with Icons, menu description, images, columns and featured with interactive ajax search mechanism suggest all the variants in a dynamic way. Theme bundled with .PO / .MO files to translate website in any language using PO composer or WPML multilingual WordPress plugin and also has 12 variants for 3 portfolio styles and 2 styles for portfolio post. Beauté is very unique and feature rich WordPress theme featured with full screen home page slider certainly amaze your visitors in first look. Compatible & tested with latest WordPress version and comes with off-canvas menu navigation which will be more handy for mobile visitors. Beauté theme has search engine friendly, cross browser compatible, multilingual ready and speed optimized premium WordPress theme included with unique contact page template, various post type templates also enabled to support 300+ Google web fonts, 400+ Font awesome icons for more typography options. Themia is unique & easy to customize multipurpose WordPress theme suitable for most kind of businesses including Spa saloon, Yoga, Meditation, Fashion, Life style, Tattoos, religion and non profit organization websites. Bundled with Infobar plugin to show notification bar on top of your website to attracts user attention and helps you to generate leads or direct users to any specific product review on your website. Also included with 16 fully editable custom made banners and use them to advertise your clients on your website. Enabled to support image / video sliders, drop down menu navigation & included with 8 built-in colour schemes, custom widgets, powerful ajax powered theme options panel along with full theme layered PSD templates as well. 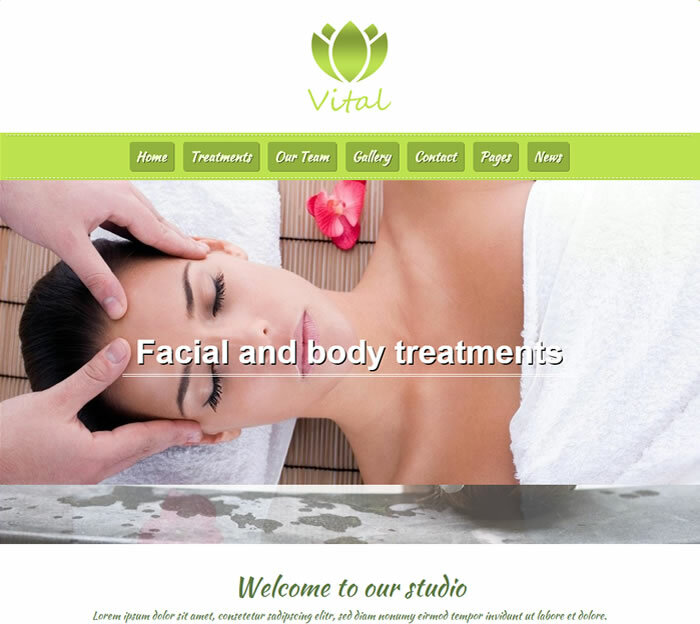 Vital is very relaxed, fresh & pleasant looking specially made beauty parlour, health care, massage parlour, spas, yoga centers and beauty treatment business websites. Vital is SEO friendly, cross browser ready premium WordPress theme enabled to support 600+ google web fonts, 300+ font awesome icons, unlimited colours, unlimited sections and comes with powerful theme options panel, XML demo content, Working contact form. Built with 100% responsive layout fits well across most device displays and compliance with HTML5 / CSS3 code standards also tested with latest WordPress version as well. If you are looking for premium WordPress theme for your makeup or fashion blogs, then you are in the right place. Pretty is clean style, ultra minimal WordPress theme comes with 3 creative header menu styles and WooCommerce compatible helps you to build your own online marketing sites. Its bootstrap 3 based, ultra responsive WordPress theme and Customize website through powerful interactive theme options panel with creative page templates, limitless font options, custom post types, custom blog templates, filterable portfolio section, awesome animations and also bundled with HTML template at free of cost as well. BeautyPress is gorgeous looking WordPress theme built with custom made drag n drop home page builder and bundled with slider revolution ($18) premium WordPress plugin helps you to create touch friendly, responsive sliders with awesome animations and transitions. 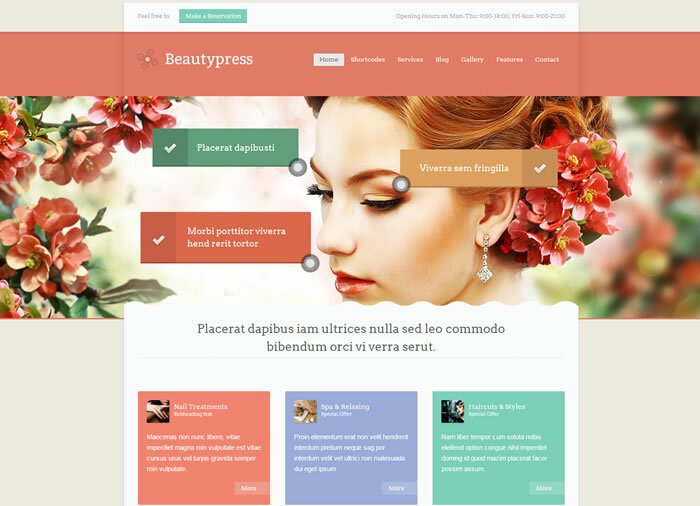 Beautypress theme comes with feature rich reservation form, sticky menu navigation, useful shortcode generator, powerful sidebar manager, custom widgets, beautiful gallery templates, useful page templates and lot more. Also built with review system, advertising manager helps you to manage feature rich website without need any third party WordPress plugins. BeautySpot is very beautiful WordPress theme featured with static navigation sidebar and beautyspot theme has 100% responsive layout looks great on all screen sizes. Choose from 8 predefined skins or create your custom one in just few minutes using SASS. This theme possess a lot of options packed on user friendly interface powered by Redux Framework and enabled to support 400+ Google web fonts, 500+ icons from Font Awesome which looks great on all screen sizes. 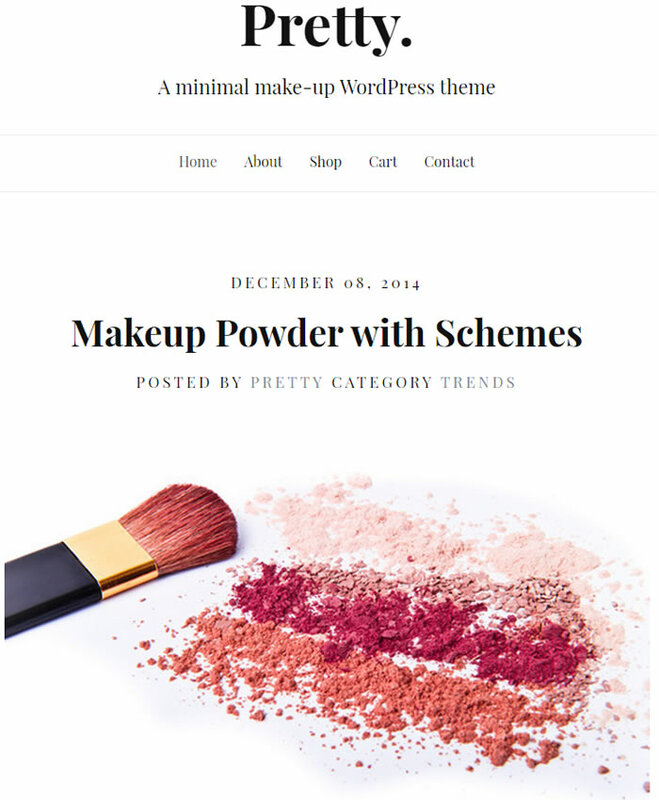 BeautyShop is ideal WordPress theme for beauty salon, hairdressers, wellness, spa websites and included with powerful custom widgets such as MailChimp subscribe form. Also bundled with very famous and most selling Visual composer ($33) premium wordpress plugin and .PO / .MO files to localize website in your preferred language. If you are not a fan of page builder, you can build your content with powerful shortcode generator instead. Rejuvenate is ultra responsive, boxed style premium WordPress theme specially made for beauty salon, spa, yoga websites and theme powered by the popular foundation framework. Setting up your website home page using drag n drop page interface and theme has 4 beautiful colour skins, customizable header, useful custom widgets, events custom post type and enabled with drop down menu navigation. Built to support custom background images and included with .PO files which will helps you to translate your website in simple steps. Build demo website using 1-click demo installer and dynamically generate thumbnails so easily from the image you uploaded. 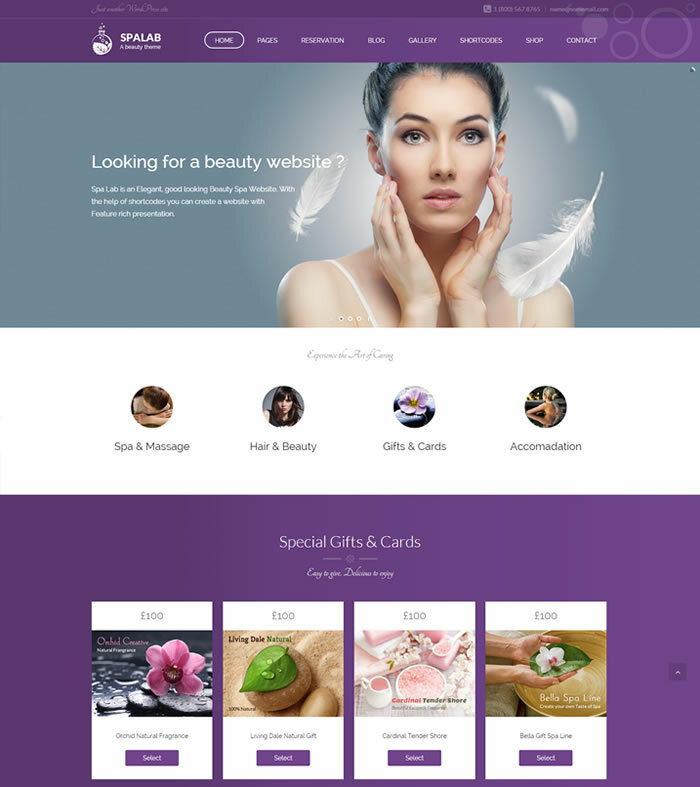 Day spa is premium beauty salon premium WordPress theme comes with awesome booking system and enabled to support WooCommerce shop plugin. Compatible with latest WordPress releases and allows you to setup pages on fly with powerful Aqua page builder plugin. Day spa is ultra responsive, retina ready WordPress theme enabled to support unlimited skins & patterns and loaded with variety of page templates, 16 custom widgets, 400+ Google web fonts, breadcrumb navigation, bunch of shortcodes, .MO / .PO files and still more. Built with HTML5 & CSS3 standards and also bundled with Slider revolution ($18) premium WordPress is key to create awesome slideshow with stunning effects. 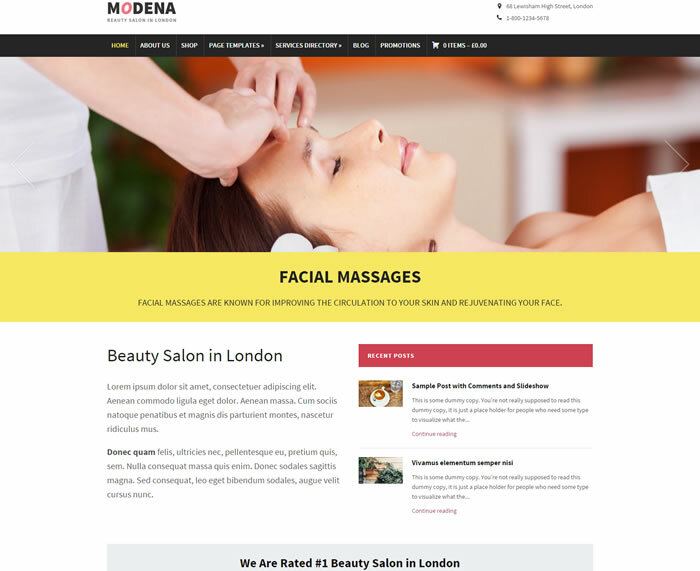 Modena is so modern & super flexible premium WordPress theme built using WPZOOM framework and quickly build your home page with custom made widgets included with themes. Built to support full width home page slider helps you configure and showcase your main products and styling the theme with custom colours and fonts using theme options panel. Modena is WooCommerce ready WordPress theme allows you to support drop down menu navigation and included with custom shortcodes, custom post / page templates and many more. Its search engine friendly, cross browser compatible, HTML5 / CSS3 compliance wordpress theme suitable for beauty salons, fitness clubs, etc. Spa Lab is really outstanding & well crafted, 100% ultra responsive WordPress theme featured with custom made drag n drop page builder handy to create pages is easier, to dive into the flexibility of the page builder to make your web creation experience smoother. Bundled with layer slider ($17) premium WordPress plugin enabled to support hardware acceleration. With retina ready feature your website look top notch in all devices and in all resolutions. Spa Lab enabled to support WPML multilingual WordPress plugin to build website in multiple languages and sell your products through your own shop with the power of WooCommerce WordPress plugin. Available with 2 home page layouts, 5 useful header layouts (with mega menu navigation) helps you to build unique website in style. Integrated with reservation facility to reserve table at specific date at a specific time and also available times are shown in order to select a convenient time. 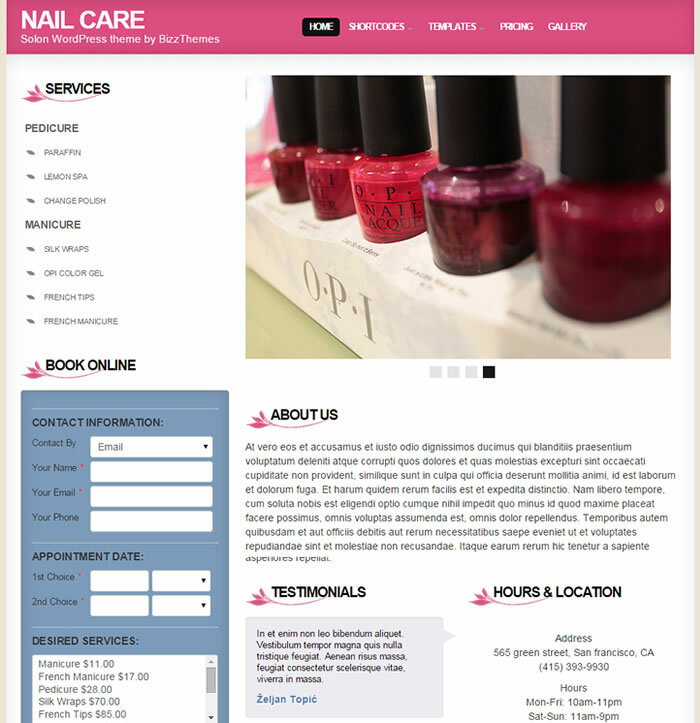 Nail Care is clean & minimalistic WordPress theme featured with full blown booking system and advanced slider. Nail care is ultra responsive, cross browser compatible, search engine friendly & grid based WordPress theme comes with unlimited page templates. Nail Care is advertising ready WordPress theme included with useful gallery templates, 15 predefined skins, call to action buttons, beautiful price tables, shortcodes, custom widgets and also bundled with layered PSD files as well. 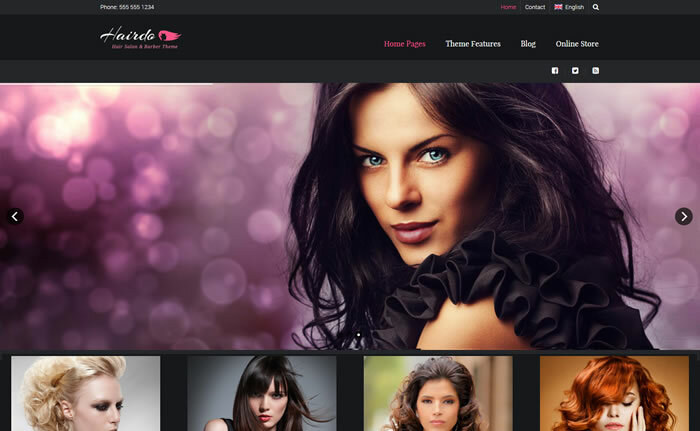 Hair salon is feature rich beauty salon WordPress theme featured with complete booking system and scheduling. Theme included with various custom post types helps you to manage services, bookings, business hours and advanced image or video sliders. Hair salon is multilingual ready WordPress theme included with useful shortcodes, 15+ beautiful skins, handy custom widgets along with layered PSD files for feature needs. 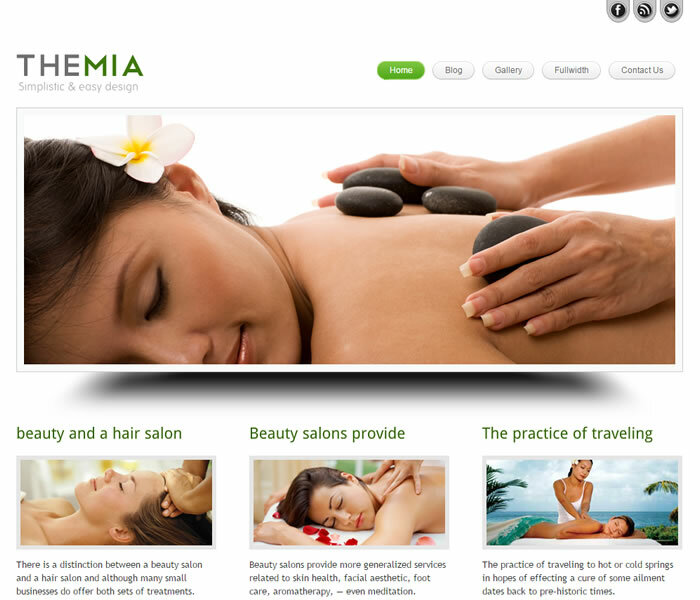 Dream spa is great looking, rejuvenating & modern WordPress theme mega menu navigation with widgets support. 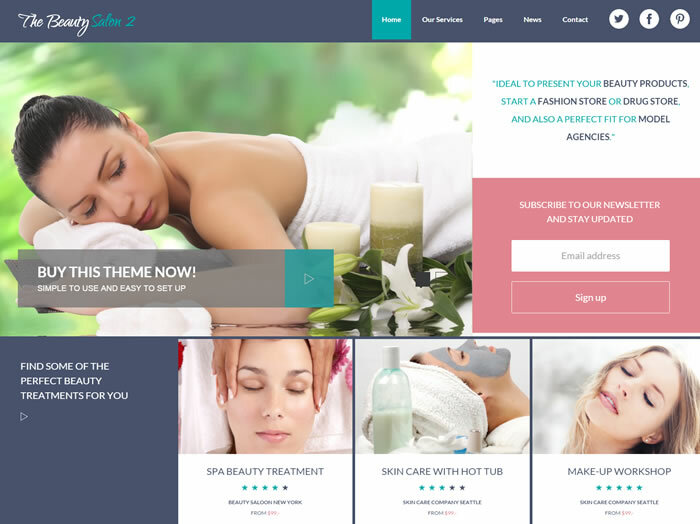 Dream spa is perfect for beauty salon, spa, yoga and health centers websites and whom looking for clean and refreshing template. Comes with awesome page builder to create pages is easier with the help of custom made visual page builder and dream spa is 100% responsive, retina ready WordPress theme makes your website looks rich in all devices and zoom through the website without losing clarity. Embrace the power of layer slider & revolution slider premium WordPress plugin bundled with the theme at no extra cost. Loaded with stunning animated gallery templates with option to choose 1,2,3 or 4 column gallery grids with and without sidebar along with stunning details page. Built to support WooCommerce shopping plugin along with with unique header designs, 6 built-in skins and included with unique blog page with blog details page to setup your blog stylishly. Appointway is multipurpose and simple online appointment booking and scheduler WordPress theme made for beauty span & saloons, health clubs, doctors, lawyers, advocate and similar businesses who looking for a website with online appointment / scheduler. Appointway is ultra responsive WordPress theme powered through smart booking system, integrated with Paypal payment gateway and included with lot of unique features such as customizable slider, easy to use ajax based theme options panel, business location map and lot more. Also bundled with Free Infobar WordPress plugin, 16 fully editable, layered banner PSD files. Citrine is Google friendly and very flexible WordPress CMS theme looks so clean & fresh and designed based on bootstrap 3 framework with 960px grid system. Citrine is 100% responsive, W3C valid and compliance with modern HTML5 web standards, built to support easy / user friendly drop down navigation menu. Bundled with 12 easy to edit layered PSD templates, 15 php pages to match your requirement for easy customization. Citrine has full screen header slider powered through Flex slider jQuery plugin and also has handy blog templates, shortcode elements, custom page templates, gallery templates and much more. 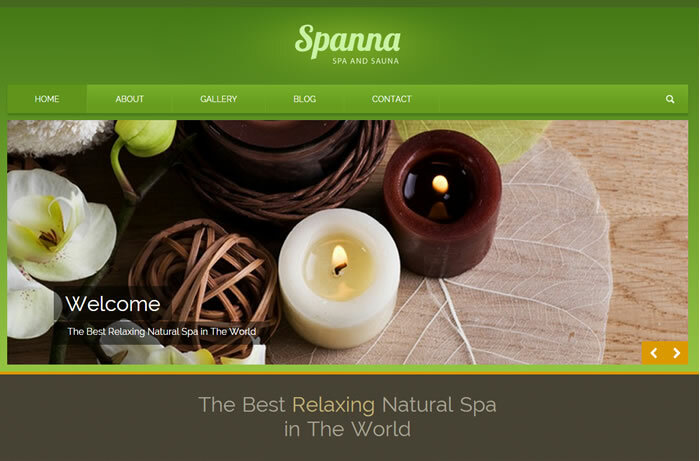 Spanna is so powerful and elegant looking WordPress theme assures fresh look for your beauty salon, spa, aromatherapy and massage businesses. Adopts any screen automatically with its responsive layout, spanna built to support drop down navigation and gorgeous featured slider which is powered by flex slider jquery plugin. Spanna has powerful theme options panel powered by SiteOrigin framework and included with Google web fonts, font awesome icons, contact page template, gallery page templates and many more. 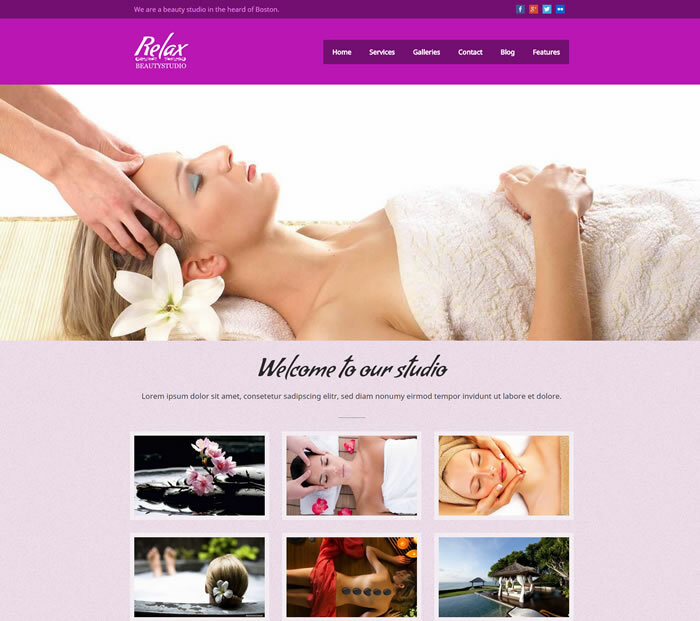 Relax is handsome looking premium WordPress theme good fit for spas, beauty salons, health care, massage parlors and related businesses. Relax theme included with awesome page, gallery and post templates with various sidebar options, social icons, shortcode generator, Google maps, threaded comments and built to support awesome full width header slider, drop down menu navigation along with advanced typography options by using Google web fonts & font awesome icons. Relax has search engine friendly, cross browser compatible, HTML5 & CSS3 compliance WordPress theme enabled to support 100% responsive layout automatically adopts user display and fits according to them perfectly. If you are looking for WordPress theme for your beauty salon or cosmetics business, then Hot Cosmetics is the right choice for you. Enabled with 3 pre-built colored styles and supports unlimited colour options via inutiative theme options panel. Hot Cosmetics theme bundled with Hot Effects Rotator (worth $19) premium WordPress plugin that rotates images using one (or combination) of 13 transition effects and theme also included with SQL dump to build demo website in seconds. Built using modern web standards, valid XHTML 1.0 transitional and search engine friendly beauty shop WordPress theme enabled to support WooCommerce shop plugin which is good enough to build your online shopping site to sell your products online. The Beauty Salon 2 is ideal choice to present your beauty products or services in style and its also a perfect fit for model agencies as well. Built using twitter bootstrap 3 framework with fully responsive layout, retina display ready WordPress theme looks perfect on your desktop, laptop, tablet PC’s and mobile phones. Powered by custom made theme options panel loaded with tons of features and options helps you to customize most website elements with user friendly interface. Built to support CSS3 animations, Google web fonts, font awesome icons and featured with full width animated header slider to show case your featured post or products as you wish. BeautyFit is multipurpose health & beauty WordPress theme featured with mobile focus responsive design be assured that its every pixel will respond to no matter what device your visitors are using either its desktop, tablet or smartphone. Best fit for hair saloons, jewelry, spa or gift shops. Its 100% WooCommerce compatible and also have full design and integration to make your site looks amazing. Comes with multiple layout options (Boxed / full width) with just a click away and support RTL languages as well. Create unlimited sidebars using ‘Crunchpress CP Framework’ and BeautyFit allows you to create unlimited sidebars, add widgets to theme and then you add to any page or post, you can even manage your appointments with appointment managing calender. Comes with BX slider jquery plugin to add and remove slider images of your choice using drag n drop interface and also supports WPML multilingual WordPress plugin which is very handy to build multilingual websites with ease. Also has 500+ Google web fonts, font awesome icons, dozens of shortcodes, powerful drag n drop page builder and bundled with layered PSD files as well. 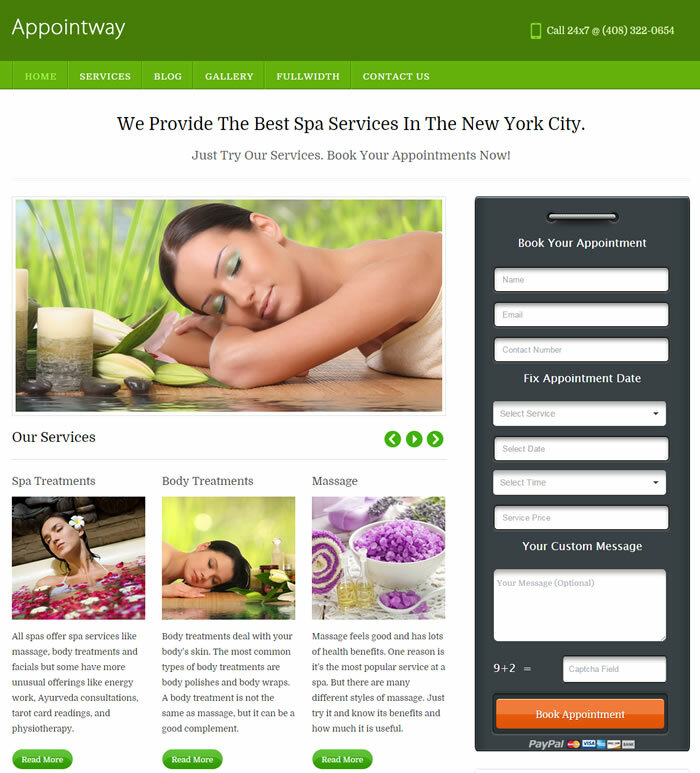 We are still try to find best beauty salon, spa, massage parlour WordPress themes online everyday. Whenever found such themes online, let we publish here immediately. 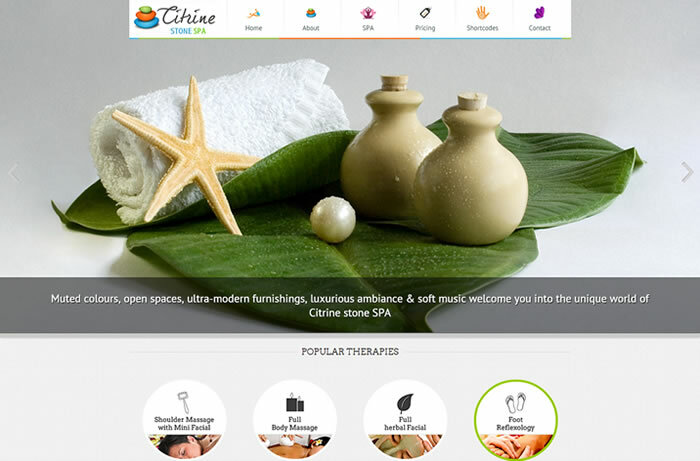 Hope you enjoy the above themes and pick the best suitable one for your beauty salon, spa, massage parlour websites. Have fun!